I’ve said before that to be a cool kid in the golfing world, all you need to do is talk about all the Coore & Crenshaw designed courses you’ve played in your life. And last week, a couple other of the GOTM guys (and gal) and me made it down to Dallas for a post-Christmas golf trip where the location was decided by finding a direct flight to somewhere without snow. Dallas got checkmarks for both of those, and also was home to Trinity Forest, one of the newest Coore Crenshaw designs. Photo taken from their website, linked above. Sixth green short, 13th green long and left of it. 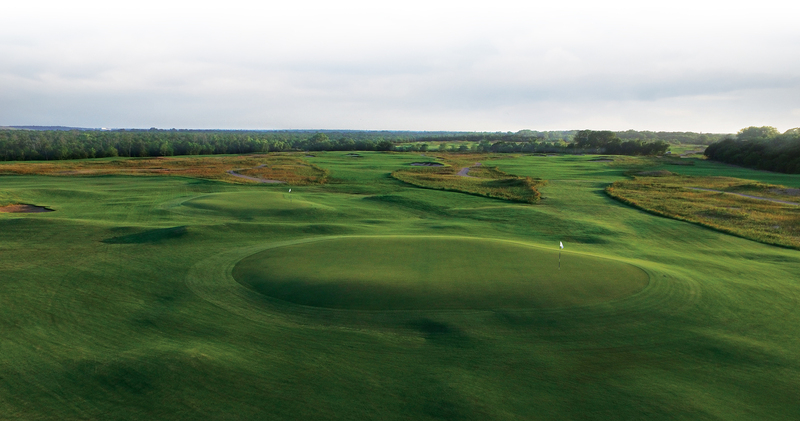 Trinity Forest, plunked just south of the city and home track for SMU’s golf teams, opened in the spring of 2016, and the big wigs of Texas also gravitated to the course right away. Jordan Spieth becoming a member (he can’t play Dallas National every day amirite? ), nobody’s favorite side-saddle putter with the SMU ties, Bryson DeChambeau has also joined. Throw in a former president in Dubya, and you’ve got yourself a Texas party. Also while we were out there, Cameron McCormick was giving a presumably $500 an hour lesson, and Emmett Smith was somewhere on the course, but try as we might, we had no luck in finding him. Facility-wise, the main clubhouse is still (and was) being built, but the makeshift trailer clubhouse has to be the best trailer clubhouse in the history of trailer clubhouses. Full bar, lockers, showers, all the hair and beauty products that could possibly be needed in a men’s locker room, lounge room, TVs, shoe shine equipment, and even M&Ms that Dylan crushed after the round. The attitude at the club was awesomely laid back too. There was a group that went off along with us, them starting on #10, who went off with those Golf Board things. Pat asked our forecaddy Jesse about the policy on phones and cameras on the course, and Jesse gave a look of “why would there be any issues with using phones?” When we rolled up in the carts that we took from the parking lot, there were a bunch of push carts there if we wanted them. And at the turn, the guy working brought out a foam cooler of beer at Dylan’s request. We headed to the practice facility first, which featured a range with an indoor teaching area (where McCormick was teaching), and on the other side, a giant facility which we learned was for the SMU team. Off to the side was a giant sloping putting green with only 3 holes cut for some reason, and connected to that was a chipping area with bunker. Off past that was a 9 hole short course, which we didn’t play.